Alright, you’ve got *massive* spoilers here, but the only person I know who intends to beat Bioshock and hasn’t yet has already read this article. Hit ‘More’ for the link to “How Bioshock should have ended”. 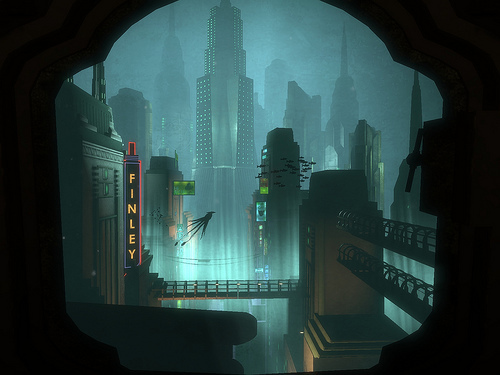 Give it a read if you’ve beaten Bioshock. Otherwise, I’d avoid it. Not only will it spoil large parts of the ending, but it won’t really make sense. It’s written in mind for someone who remembers most of what happens, and does not provide any build-up information or definitions for terms, people, places, or ideas discussed. So, it simply won’t make any sense without context. I agree with a lot of what this guy says. He disputes the common misconception that “the game should have ended after the confrontation with Ryan.” There’s a lot of important Origin material after that, including what makes a Big Daddy, and more importantly what makes a little sister. The little sister orgin story is creepy, dark, and well-written. Unfortunately, it is incredible subtle in its presentation (scratchings on walls, optional tape recorders, set piece rooms with inferred knowledge of what they were used for). There’s no way you would cut that out instead of, say, the stupid forest level or the Dr. Surgeon level. *Those* were useless. Bioshock’s last 30-45 minutes were incredibley weak, but there is still a good 4 hours of gameplay still there; the confrontation from Ryan is hardly near the end of the game. This guy helps suggest excellent fixes for a few narrative holes, and also provides a much better final fight plus, what I think, is an excellent ending. He also makes a great point in that the Outside was not only never fully explored, but never explored. After that first great ride into Rapture, every other transition is a damn load screen. I hated that. For a city underwater, it rarely felt like it except for a couple tubes here or there, and ironically those were hallways, so you always looked down them at your destination, and not around you at the Ocean. Props to mattlindh for pointing this article out.